Don't panic I will post a picture of an adapter that uses a normal gas bottle in conjunction with an S30 injector. I made it years ago when we moved to France where S30 cylinders are not available and no retailers will post them to France. Don't throw away your empty cylinders because the are needed to make the adapter. That would be great if you could post that picture IPA, I could see it being very useful to forum members. I will do it later today. Here it is. 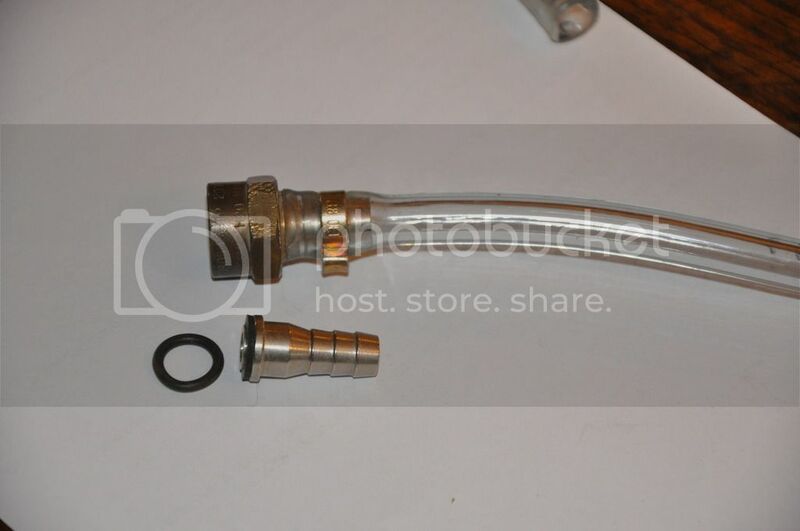 I removed the top from an S30 cylinder and drilled it out to the same diameter as the hose adapter shown below in photo. The O ring shown goes between the S30 injector and this adapter. I then attached the hose with a jubilee clip. On the other end of hose is a connection to suit your gas regulator. Thank you IPA, that will be really useful when my current cylinders are empty. Would you mind clarifying the size and where you bought the hose adapter if possible? I bought it from toutpourlabiere.com but I can't find it on their website. If you ever need one send me a PM and I will pick one up and post it to you. Sorry if this is a naive question - but does anyone know of an adaptor that would allow the S30 inlet valve on my keg to be replaced with a standard inlet post? I have a non Cornelius keg that has a hole where the normal inlet post would be and the existing S30 valve fits into that hole. It would seem logical to replace the S30 inlet with a standard post - but I can't see any available. Whilst not the main issue I have had it was one of the drivers which has led to me phasing out the used kegs I initially started out with to the new AEB kegs. I bought some of the 'older' type posts which were incompatible with the old kegs I had which was annoying. Home Brew Life have found someone willing to refill these now. My usual dealer is out of stock on filled ones and sitting on a stock of empties - they say that they don't know where they will get more from. Does anyone have an update on the latest supply situation? Has anyone taken it on and who are they?